June 2018 31 I n f o r m a t i o n R e q u e s t # 4 0 6 Is a Vehicle Mileage Tax on Its Way? 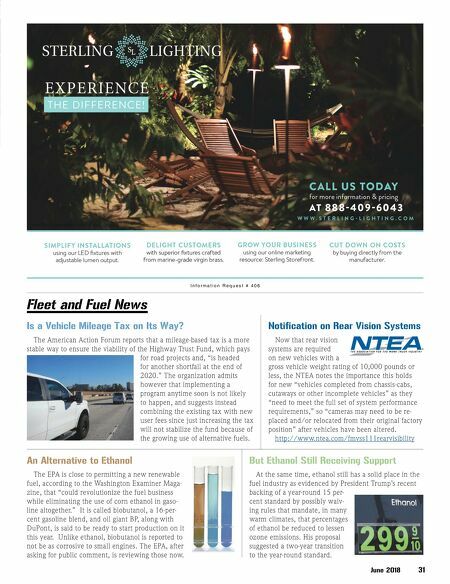 Notification on Rear Vision Systems An Alternative to Ethanol But Ethanol Still Receiving Support Fleet and Fuel News The American Action Forum reports that a mileage-based tax is a more stable way to ensure the viability of the Highway Trust Fund, which pays for road projects and, "is headed for another shortfall at the end of 2020." The organization admits however that implementing a program anytime soon is not likely to happen, and suggests instead combining the existing tax with new user fees since just increasing the tax will not stabilize the fund because of the growing use of alternative fuels. Now that rear vision systems are required on new vehicles with a gross vehicle weight rating of 10,000 pounds or less, the NTEA notes the importance this holds for new "vehicles completed from chassis-cabs, cutaways or other incomplete vehicles" as they "need to meet the full set of system performance requirements," so "cameras may need to be re - placed and/or relocated from their original factory position" after vehicles have been altered. http://www.ntea.com/fmvss111rearvisibility The EPA is close to permitting a new renewable fuel, according to the Washington Examiner Maga - zine, that "could revolutionize the fuel business while eliminating the use of corn ethanol in gaso - line altogether." It is called biobutanol, a 16-per- cent gasoline blend, and oil giant BP, along with DuPont, is said to be ready to start production on it this year. Unlike ethanol, biobutanol is reported to not be as corrosive to small engines. The EPA, after asking for public comment, is reviewing those now. At the same time, ethanol still has a solid place in the fuel industry as evidenced by President Trump's recent backing of a year-round 15 per - cent standard by possibly waiv- ing rules that mandate, in many warm climates, that percentages of ethanol be reduced to lessen ozone emissions. His proposal suggested a two-year transition to the year-round standard.